2. Lay out about 13-16 sheets of rectangular tissue paper on top of each other. You can either make the ball one solid colour by stacking sheets of the same colour tissue or you can stack 2 varying colours (red/green/red/green) to incorporate multiple colours in one ball. 3. Make 2″ wide accordion folds, creasing with each fold. 4. Tie string around the middle of the tissue making sure it is long enough to hang your decoration later. 5. At this point you could curve the edges to make more of a flowery ball. Fan out one half of the tissue. 6. Separate the layers, pulling away from the centre one at a time. 7. Keep pulling down all the layers on both sides until you have a full ball. 8. 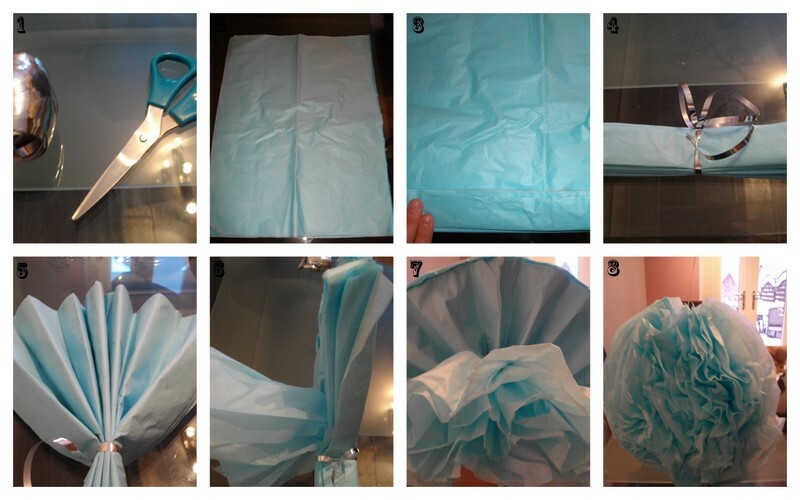 Ruffle the tissue until you are happy with the look and hang your decoration. She HATES wearing that coat but loves it when she gets all the attention when she's out on walks.